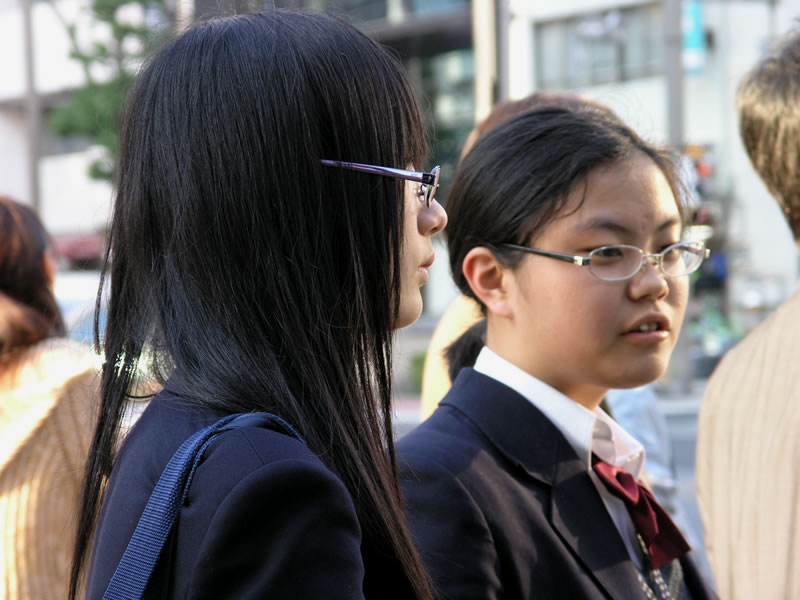 Megane Culture: Japan’s Love Affair with Glasses They reflect who you are on the inside and look super cute with that outfit. Glasses. I choose to wear glasses. I own contact lenses, and I can finance laser eye surgery, yet I still choose glasses. Glasses just make sense. Perhaps if my profession deemed eyewear to be an obstacle, say skydiving or kite surfing or something requiring me to bare my eyes, I would reconsider. As it is, I go without, or is that go with? Glasses are me, and in Japan, while not my defining trait, the word megane 眼鏡（） (glasses) is often used to describe men and women who wear them. “Me-ga-ne-kun!” Yo-yo wagged her finger as she playfully tried to dissuade me from entering the fifth optical shop on our itinerary. Donning a lensless pair, her eyelashes extended beyond the frames. She batted her eyes, pouting, “No more today? I’m hungry.” Crossing an arm, she pointed to her chin. 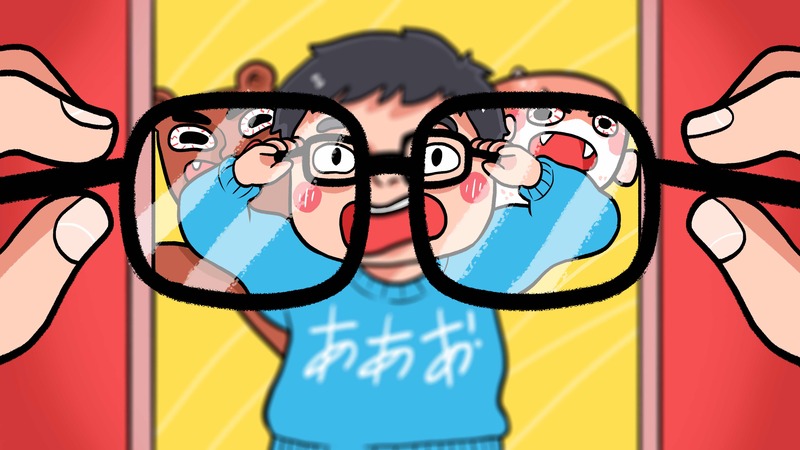 For every Meganekun there are three Meganekko メガネっ娘（）, and she is that glasses wearing girl! Going ten notches further than her masculine juxtaposition is a pleasant, bookish, clever class representative, the hall monitor, the prefect minding the shop. This isn’t just some kind of anime trope. It’s real, in the work place, at school, and on the street. Meganekko isn’t the hot secretary or naughty librarian. She is not playing coy. Unfortunately, what this also means is that glasses are often thought to be her most attractive trait, or rather, what her glasses symbolize. Taking Meganekko’s glasses away rarely ends well. Why? Because she needs them. In 1549 the Society of Jesus founded in Spain sent missionary Francisco St. Xavier to Japan. Taking possession of the many gifts the Jesuit brought, the Japanese also acquired eyeglasses for the first time. It was only later in the 17th century that Japanese artisans began polishing natural quartz into ophthalmic lenses. Later in the century, glass was substituted for quartz. And it was at this time Japanese “gem-artists” (opticians) began designing frames with ergonomics in mind. From early optics to today’s modern form, Japan reveals itself in its pursuit of adaptation, quality, and aesthetic. In 1873 the Japanese government sponsored Matsugoro Asakura to study optical manufacturing in Austria. Having returned to Japan in 1875, Asakura began building a lens making factory. By 1883, his son, Kametaro Asakura produced Japan’s first multi-element photographic lens. The Sino-Japanese War (1894-1895) saw the importation of high powered Carl Zeiss (German) binoculars which highlighted the strategic necessity of quality optics. This military need created a rush toward domestic development as well as the beginning of many well-known Japanese manufacturers. 1911 – Fujii Bros. import German fabrication equipment and Zeiss measuring instruments to manufacture quality optics. 1914 – World War I begins. 1915 – Optical glass supplies from Germany interrupted. 1917 – Fujii joins with the Tokyo Keiki Seisaku Sho (Tokyo Measuring Instrument Works – metal fabricators), and Iwaki Glass, (also Mitsubishi, who provided investment funds), to form Nippon Kogaku (Nikon), for the purpose of manufacturing optical munitions. 1918 – Nippon Kogaku exported over 15,000 prism binoculars (in 18 models) to England, France, America, and Russia. 1919 – Asahi Kogaku (Pentax) begins manufacturing ophthalmic lenses. 1919 – Takachiho Seisaku Sho (Olympus) founded. 1921 – German scientists and engineers brought to Nippon Kogaku for redesign. 1928 – Nichi-Doku Shashinki Shoka (Minolta) founded. 1930s – Nippon Kogaku develops highly effective field reticle binoculars. 1933 – Seiki Kogaku Kenku Sho (Canon) founded. 1934 – Fuji Photo Film Co. founded. 1938 – Fuji begins producing optical glass. 1939 – Nippon Kogaku ramps up production with 25,000 employees and 25 factories. 1942 – Minolta commissioned by Japanese Navy to manufacture optical glass. With significant history behind the lens, no reader should be left in doubt as to Japanese competence in the field of visual acuity. If the timeline demonstrates that, “necessity is the mother of invention,” then I will note that war is the invention of necessity. As with the need for precision glass optics in military use, advancement of plastics can also be attributed to the munitions industry with their innovations in both lens and frame materials. Recent military lens technology, such as Trivex, has led to dramatic improvements in material clarity, strength, and weight. Further redefining the optics industry, Japanese manufacturers Hoya and Seiko have begun using digital eye mapping technology, otherwise known as Wavefront (the same technology utilized for laser eye surgery), in creating precision tuned High Definition eyeglasses. 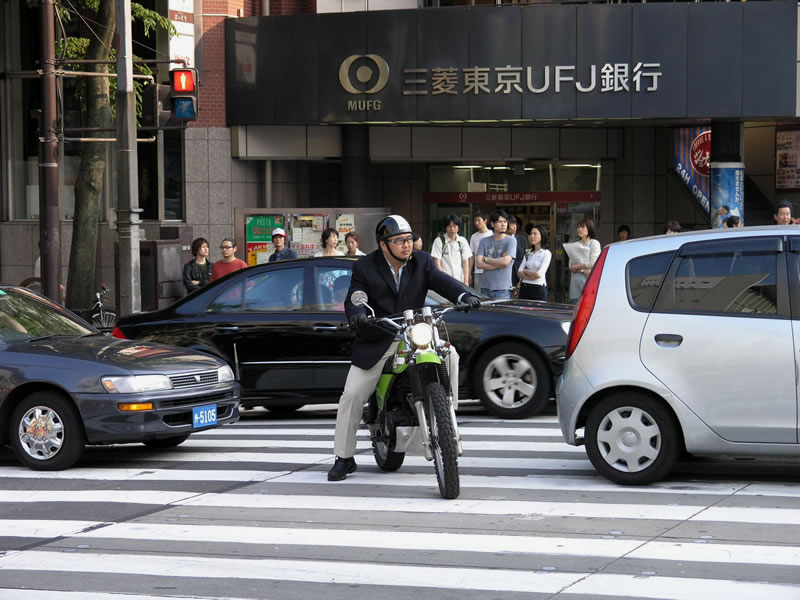 As a rule, dispensation of corrective lenses throughout Japan is much less regulated than in the Western world, which significantly cuts down on cost. In addition to the fierce competition that exists between retail outlets, these savings are passed directly to the consumer. So let it be argued that any trip to Japan would be remiss if one were to forego a visit to one of the many optical dispensaries. The first thing that hits a customer when entering a Japanese optometry is the sheer number of quality frames. They carry everything from the super chic to the overtly funky. Just as one might compare 100-yen shops in Japan to those dollar stores abroad, there exists a lopsidedness. Part of the equation is the relative distance of Japan from their foreign subsidiaries, this, in addition to the vast number of domestic competitors, creates a win-win scenario for shoppers. Eye wear is strictly personal and one of the first and last things people will remember when they interact with someone who wears them. So of course, choosing the right pairs isn’t science, it’s inevitable. Now one may argue that online retailers are cheaper, and I concede, they are a third of the cost compared to brick and mortar shops in Japan. But the cost argument is finite. There is no comparison when online retailers are put up against every other measure. Online quality cannot stand to brick and mortar businesses when it comes to immediacy. And let’s not start into the whole branding debacle. One of the nicest things about Japanese optical is the huge selection of unbranded frames. In the future, everyone wears glasses. Sure, you’ve heard of Google Glass, but have you heard of Jin’s Meme? Recently, I was listening to a program featuring Nicholas Negroponte (founder of MIT Media Lab), a man who predicted the widespread use of touchscreen tech in a Ted Talk from 1984. Yeah, okay, one might say that Gene Rodenberry, the creator of Star Trek (1966), was perhaps the first to actually visualize the touchscreen on screen. None the less, the Japanese optometry chain Jin’s is siding with Negroponte’s outstanding futurist prediction: the proliferation of eye tracking technology. So what do these glasses do? They watch you. Essentially, it’s all about bio feedback. Negroponte sees these devices as the next leap, acting as a kind of virtual assistant, something like the Operating System in the film Her (2013). When excited, our pupils dilate. When tired, our blinks weaken. There is something smart about future spectacles, something narcissistic, and something definitely cool. Before this future, Japanese optical shops are it, the best, perchance the definers of worldwide style and precision. I’m not obsessed, I’m a connoisseur. So what if I own more glasses than I do shoes? Some pairs I’ve had for ages, favorites, simply replacing lenses as needed. Most times I’m being absent minded and I break them. Other times, they’ve saved me from peril. Thankfully, I’m never far from replacements. And there’s something quaint about shopping for necessity. Remember that thing I said about war? 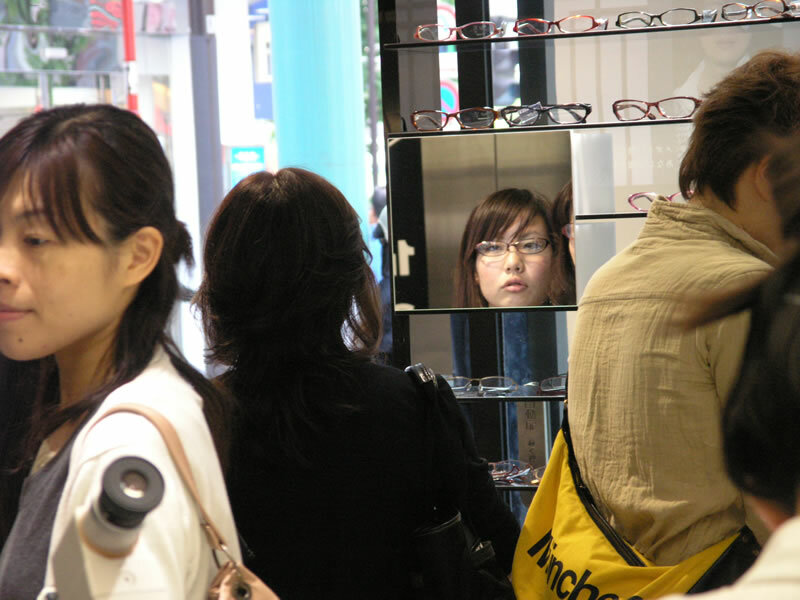 Purchasing eyeglasses in Japan is much the same as it is around the world: find a frame, supply your prescription, choose your lenses, and pay the cashier. Don’t have a prescription? No problem, it’s included in the price. Don’t want a new prescription, but forgot your current one? No problem, the shop will pull your prescription from your current lenses. The real treat about purchasing eyeglasses in Japan is the sheer volume of style. Eyeglasses are all at once elegant, practical, and fun. Try them on, bring a friend and take a chance on something so totally not you. There is nothing wrong with an alter ego or two. I’ve returned to the shop; it’s an hour later. The clerk pulls my newly minted glasses from their case while I sit before her. She opens each arm and I lean forward allowing her to position them upon my face. She delicately lifts the frames by the temples to judge their fit before retrieving them to make a slight adjustment. We do this a few times, and I’m smiling. Yo-yo faces away, her legs crossed. She maintains a masterful blank stare as the clerk grants me a final, wicked grin confirming everything I already knew.